Planet JUPITER, the Controller of Dharma(Good Deeds & Benevolence) in the Solar System. 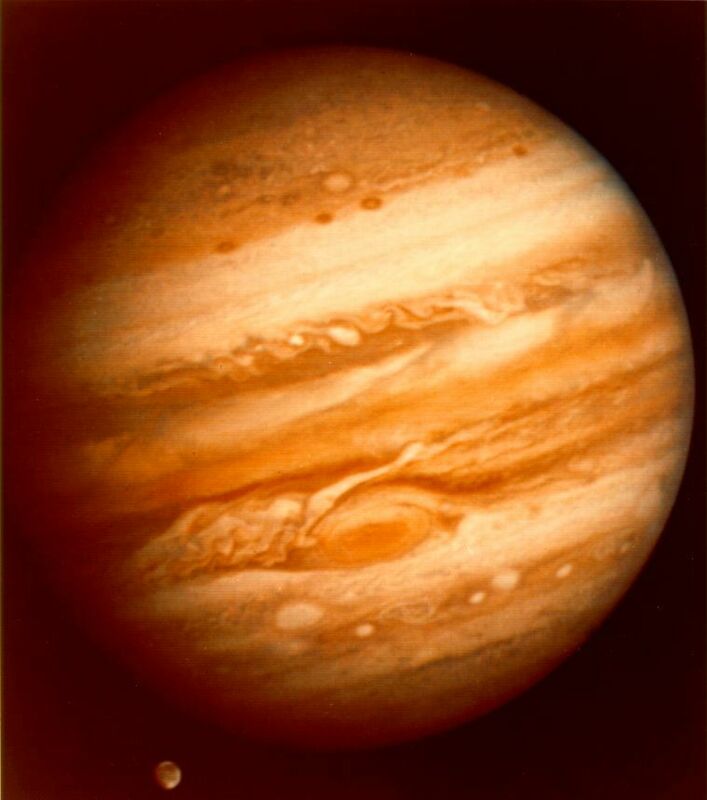 The planet Jupiter is ruling Sagittarius and Pisces, the 9th and 13 sign of the zodiac and rules number 3. People either born on 3, 12,21 or 30 OR on Thursdays or in December or March are primarily ruled by Number 3= Jupiter. This planet gives, command, control, love for discipline and ethics but at the other end could make one dictatorial or too bigoted in opinions (religiousness gone to extreme). Jupiter is said to be the law maker- the person who lays down law- people influenced by this number want laws/rules- hence could make many enemies in the process. Jupiter is karaka/signifactor of 5th and 9th and also 2nd house- so it does represents children, wealth flows, dharma and luck. In true sense it’s the planet of expansion. It is a planet for friendships, socials and well being. People influenced by Jupiter are generally ambitious and warm, but may be careless about money. They invariably are at the top- but in doing so they might stress their nerves. Jupiter aspects with maximum energy the houses, 5th, 9th and 7th from the place it is placed in your horoscope. Unless ruling a malefic house ( 6th/8th or 12th), Jupiter is a great benefic and make you blessed! If you are born on 3,12,21,30 or Thursdays. Or Jupiter is strong in your chart or your ascendant or moon sign is Sagittarius or Pisces. See how your Thursday or dates 3,12,21 or 30 go. Do you make good money, or you have good friends, you have great compassion and love for nature or you like conventions- then you might be a jupiterean. Your health : Nerves need to be taken care of so is liver and basic digestion. Skin has to be kept healthy with exercise. Your Lucky Stone : Yellow sapphire or topaz. Note 9= 3×3 and 12=3×4, so one can clearly see that pure Jupiter value are in the Sign Sagittarius(9th sign = 3 x 3= Jupiter X Jupiter) , which is followed by the mental sign of Jupiter, that is Pisces( 12th sign = 3×4 = Jupiter X (Rahu or Uranus)), causing Pisces people being insecure about money(Rahu/Uranus causes insecurity in minds- especially for money)- but rest of the Pisces qualities are mostly same as Sagittarius, as both are ruled by planet Jupiter. Jupiter is a benefic by nature. The units of movement of guru/Jupiter is 5-15 units. Guru hives the knowledge and happiness. Jupiter is amongst the ministerial planets and also venus.The deity ruled by Indra.Its a male planet. Planet Jupiter or guru represents space in terms of panchamahbhutas. Jupiter and Venus(shukracharya ) are Brahmins by caste. The planet Jupiter is sattvik(pure), Venus and mercury are Rajasik- it is a guna/quality, and mars and Saturn are Tamasic in nature. Jupiter’s has knowledge of ancient texts and also modern texts of knowledge, it has a big body and tawny(yellowish brown) body and hair. The phlegm is higher and Jupiter tends to be more intelliegent.The abodes of Jupiter, that is where it can be found is treasure house. 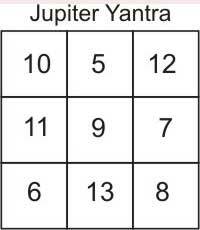 Note Jupiter is ruled by number 3, the number for prosperity. A duration of month is for Jupiter, just like for muhurtha we look at moon position. The taste of Jupiter is sweet, a weak Jupiter we know causes diabetes- that is problems with sweetness. Jupiter is a planet of east so is strong in east. People with strong Jupiter generally are born or get attracted to eastern cultures. Trees ruled by Jupiter are with fruits. Saffron colored robes are ruled by Jupiter. That is of a monk. During the dark half malefic are strong(that is sani/Saturn, rahu/ketu). Benefics acquire strength in the bright half of the month. Hemant ritu(early winter) is ruled by Jupiter. Guru rules jivas.Jupiter is exalted in cancer.